Veteran Yahaya Mohammed was on target this afternoon as Aduana Stars beat Techiman Eleven Wonders by two goals to one in Match Day-2 of the Ghana Football Association (GFA) Normalization Committee (NC) Special Competition. 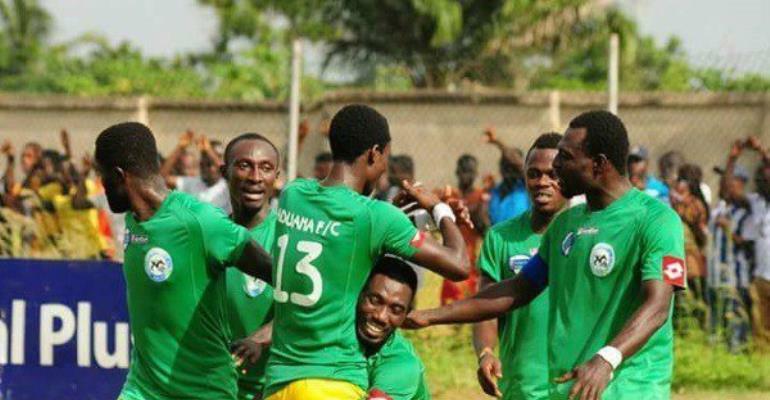 After falling short to the might of Kumasi Asante Kotoko over the weekend at the Baba Yara Sports Stadium, the Dormaa based club recovered from that defeat to beat Wonders in front of their home fans. Captain Yahaya Mohammed whose saw his goal disallowed in the Kotoko game for offside was not going to be denied another time as he found the back of the net for the hosts just 30 minutes into the first half. On this occasion, the goal was adjudged legit as the home crowns were sent into jubilant mood. Both teams could not get on the score sheet again at the end of the first half with Yahaya’s goal proving to be the only difference. Aduana doubled their lead courtesy a strike from Abdul Fatawu on the 75th minute. The away pulled one back shortly after through a goal scored by experienced Ghanaian striker Alex Asamoah. His goal was however not enough as they suffered their second loss of the NC Special Competition. Wonders were pipped 2-0 by Ashanti Gold in their opening match. They are now in danger of being eliminated from Zone A which has top teams like Kotoko, Medeama, Aduana and Ashanti Gold.